GAROU: MARK OF THE WOLVES (v1.1) — Mobers.ORG — Your Daily Source For Mobile FUN! This latest installment in the legendary series from SNK welcomes a new hero with Rock Howard, the posthumous successor of Geese Howard who was raised by the “Legendary Wolf” Terry Bogard, and a host of all-new charismatic characters with their own unique background story and goals. “GAROU: MARK OF THE WOLVES” renews the series with the “T.O.P. SYSTEM”, a revolutionary game mechanic that can be set anywhere on the character’s lifebar and gives access to a unique attack and significantly increases the character’s hitting power. Moreover, the “JUST DEFENSE” mechanic offers a multitude of bonuses to the player if he successfully blocks his enemy’s attacks at the last moment. Finally, the “BREAKING” feature allows to cancel specific special moves to other for impressive combos and damage. With the exception of the series’ historical hero “Terry Bogard”, all the participating characters in “GAROU: MARK OF THE WOLVES” are new, and some of them have some connections with characters from previous installments. In addition to the 4 & 6 button type layouts, the “SP” and “FM” special buttons allows the user to respectively activate Special and Desperation Moves with the touch of a button. 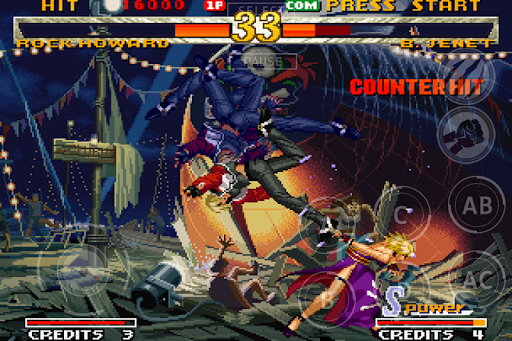 Furthermore, this faithful port of “GAROU: MARK OF THE WOLVES” features a “PRACTICE” mode, in which you can train all you moves and best combos, a “SURVIVAL” mode, where you fight all the game characters until your life bar depletes to zero. 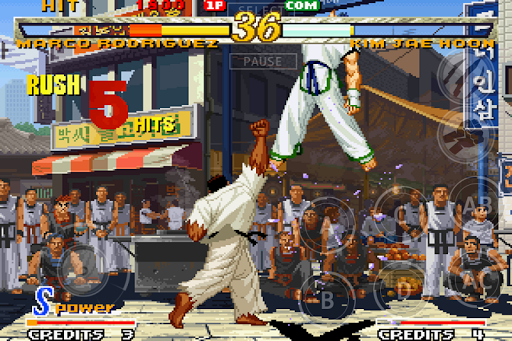 Finally, “GAROU: MARK OF THE WOLVES ” is also compatible with “Bluetooth” game controllers for the best game experience ever. Challenge your friends in intense and epic battles via your smartphone’s Bluetooth functionality!